Procedural rules of Latvia provides for lack of foreign exchange control, and publication of the rules on supervision over foreign companies, and as a consequence, the jurisdiction is cost-efficient for the organization of new businesses. Norms of regulation of insufficient capitalization and transfer pricing are also in force in the country. Company registration in Latvia requires the involvement of legal specialist. Company Law & Trust International offers legal assistance at all stages of the business establishment in Latvia. It is possible to apply for the initial consultation by visiting our office or contacting us by phone. The clients are also being supported on the website in online chat. The rate of income taxation is 15%, which is the lowest level throughout Europe. The presence of preferential treatments: if the founder obtains dividends from abroad, such income is not taxable. If dividends are paid to legal entities which are non-residents, and the source is exempt from tax contributions. The founder is entitled to obtain multiple-entry visa, which makes it possible to move freely within the borders of all states of the Schengen Agreement. When performing a number of conditions non-resident can get residence permit in the country, and the list of requirements should be specified with the consultants of the company Law & Trust International. When registering company in Latvia it is very easy to obtain certificate of tax resident, which will enable to pay contribution to the state treasury at the rates corresponding to the rates for Latvian citizens. Registration of offshore company in Latvia is impossible, because the state is not relating to any offshore zone. However, Latvia gets benefit from the lack of offshore companies: companies and entities registered in the territory of the State are not included in blacklists. 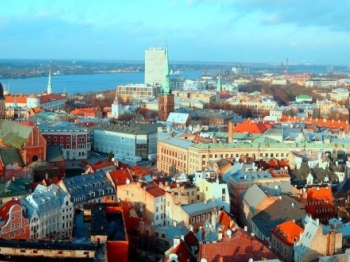 Only fraudsters can offer to register offshore company in Latvia. Charter capital of the company is divided into shares; each participant takes responsibility within the amount of his contribution. Establishment of the company in Latvia is possible without visiting the country by means of services of attorney. Lawyers of the company Law & Trust are ready to fulfill obligations concerning representation of your interests. Registration of offshore company is not possible in Latvia, but the undertaking can be 100% shareholder of SIA, and presence the Director who is resident is also not provided as a mandatory requirement. When creating company name, only letters of Roman or local alphabet should be used. The name is required to contain references to organizational and legal form of the company, and it is prohibited to use the word «Latvia». Registration of legal address is obligatory. Its purpose is to send correspondence. The address should be within the borders of Latvia. There is possibility to clarify the other terms and conditions of registration of SIA in Latvia with our lawyers during personal consultation. Joint stock company can be registered either by residents or foreign nationals. Applications for registration are accepted from legal entities and natural persons. Charter capital of the company of this organizational and legal form is divided into shares, which are subsequently in free float. Minimum level of capital ranges from 35,000 euros, and it is required to contribute the sum within one year from the date of foundation of the JSC. Registered shares are issued in free form, and bearer shares are also permitted, but should be registered with a special depository. Management should be performed by the board of of directors or the shareholders' meeting. Company Law & Trust International offers free consultation of the founders concerning registration of businesses in Latvia. With the range of our services you will be able to avoid a lot of legal errors. The judiciary The Supreme Court, the Constitutional Court. Parliament confirmed the appointment of judges. Legislative authorities Unicameral Parliament or Seimas. Includes 100 seats; members are elected proportionally from party lists for a period of 4 years. Corporate tax rates details On 1 January 2018, Latvia moved from tax regime under which companies subject to tax on annual taxable profits to system where tax paid only if corporate profits distributed or deemed distributed. Certain expenses deemed to be similar to profit distributions taxed at an effective rate of 25%. In Latvia, the Trademark Registration Request considers a product/service descriptioof up to 100 words; each 100 additional words has a fee USD 80.